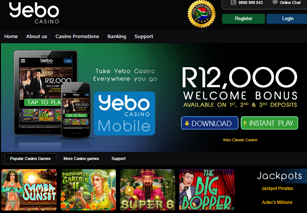 Yebo Casino , a South African online casino that was launched in May 2014, is definitely one of the highly recommend casino sites for South African players. You can wager and win large jackpots in Rands, and you don't even have to wait long for your winnings as Yebo processes payouts quickly. Some of the best mobile casino games can also be found and this exciting new casino. The online casino, which is operated by Riviera Rewards and licensed by the government of Curacao, give top priority to customer satisfaction, fair play, and responsible gambling. You can therefore expect a safe gambling experience. Since Yebo Casino is powered by Real Time Gaming (RTG) software, it has some of the best online casino games in its portfolio. You can choose from more than 500 exciting games, including slots, video pokers, and table games. Play roulette , baccarat, or blackjack or choose from one of the several classic, multi-line, or progressive video slots at Yebo Casino. Since most of these games are available in the demo mode, you can learn their rules and strategies without risking your money. Yebo Casino offers an excellent mobile casino product, powered by RTG and compatible with iOS, Android, and Windows operating systems. This gives you the wonderful opportunity to play your favourite online casino on the move and even win a progressive jackpot or two as several delightful progressive jackpot games are now available on the mobile platform.The mobile gaming experience is just as good as the online casino experience. Mobile casino players can claim all the bonuses available to online casino players. They can also take part in the free slots tournaments and earn rewards for loyalty. Sign up at the mobile casino now and input the bonus code PLAY100 to receive a free no-deposit bonus of R100. Playing at Yebo Mobile Casino is as safe, secure, and fun as playing at the online download or Flash casino. Android, Windows, Apple Devices: iPhone 4S, iPhone 5, iPad 2, iPad (3rd generation), iPad (4th generation), iPad Mini, iPod Touch (5th generation with A5 Dual Core chip), Samsung Galaxy S3, Samsung Galaxy S4, Google Nexus 4, Google Nexus 7, Samsung Galaxy Tab 2 7, Samsung Galaxy Tab 2 10.1. As a newly registered player at Yebo, you can lay claim to a R100 free No Deposit Bonus, which will be credited to your account as soon as you redeem coupon code : PLAY 100. Once you have deposited funds in your account, you become eligible for a welcome bonus package of R12,000, spread over your first three deposits. You can claim a 150% up to R2,150 bonus on your first deposit, a 75% up to R3,750 bonus on your second deposit, and a 50% up to R6,000 bonus on your third deposit. As a loyal member of Yebo, you can also grab VIP benefits in the form of loyalty points and VIP points. The online casino will reward you with points that can later be redeemed for cash just for playing real money casino games and mobile casino games. This VIP program has four levels, and depending on the level you have achieved, you will receive birthday bonuses, cashbacks on your weekly losses, and monthly deposit bonuses. Play daily free slots tournaments at Yebo Casino and win real money prizes. Since the online casino holds promotions every day, you stand the chance of grabbing free spins and bonuses daily. You can fund your account using reliable deposit methods such as Wire Transfer, Visa, MasterCard, Skrill, Neteller, and ecoPayz. Details about each method are available on Yebo Casino's banking page. If you are looking for the ultimate online or mobile casino gaming experience, you must give Yebo Casino a try. You have nothing to lose, but a lot to gain as Yebo Casino offers the greatest bonuses and the most entertaining casino gaming experience. Sign up now at Yebo Casino to play online casino games for fun or real money.